Priced: $118.99 - $140.00 Rated: - 5 stars out of 5 by 3 reviews. Strangle the competition with speed and agility in the Asics Women's Gel-Noosa Tri 9 Running Shoe. Vibrant colors, seamless construction, and super-sticky soles will make hopping out of the saddle and hitting the road an easy experience. If your racing triad involves early-morning acrobatics getting everyone out of the house, a mid-morning run, and the terminal event of carpool-kid wrangling, this cushy shoe will keep you going strong all the way through to the finish line of dinner with the family. Asics designers chose to forgo seams when putting together the open mesh upper and perforated sockliner. No seams reduces the chances of blistering, and open mesh gives your hard-working foot the chance to feel the breeze, even if you're not stopping to smell the roses. The close-hewed fit and slipper-soft liner lets you go sockless for quick transitions. The Solyte midsole leaves weighty EVA behind and gives you a majorly cushy midsole without extra heft. Whether you're pounding through the final miles at Kona or hitting the neighborhood for your daily run, the 10mm heel-forefoot drop welcomes both mid-foot and heel-strikers, and the cushioning reflects the Noosa's unbiased position. Gel up front and in back minimizes impact and helps move you through your gait cycle without a hitch. The Impact Guidance System ("IGS") and Propulsion Trusstic work with your foot so you're not fighting the shoe to move from impact to toe-off. DuraSponge high abrasion rubber mixed with Wet Grip rubber gives you a durable outsole that won't leave you grasping for traction if the road ahead is more slippery than you first thought. The Asics GEL-Noosa TRI 9 Running Shoe for Women has a seamless construction, which reduces the potential for irritation and friction caused by traditional stitches and seams for optimum comfort. This running shoe has an open mesh upper and Perforated Sockliner improves breathability and moisture control during athletic performance. From day one of training, and all the way up to race day, you can count on the speedy performance of the ASICS® GEL-Noosa Tri™ 9! Successor to the GEL-Noosa 8, SKU# 8053294.
promotes enhanced breathability and moisture drainage. 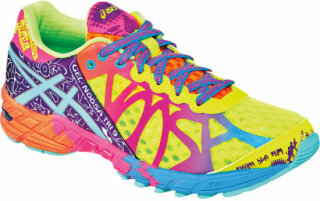 The ASICS GEL-Noosa Tri 8 running shoes falls almost a full ounces in weight, forcing every package possible. Pierced sockliner and open capable upper increases wetness waterflow and drainage and breathability, secured by new lenticular supports. The optionally available flexible ribbons and improved high heel and mouth holders make the conversion smooth from bike to run. Space Trusstic System makes conversion from midstance to toe-off quick and efficient. Impact Assistance Program (I.G.S.) and Assistance Line technologies enhance the foot's natural step from high heel attack to toe-off for excellent relaxation as well as. GEL Assistance Program in both the foot and ankle provide excellent cushioning throughout. DuoMax Assistance Program increases support and balance for the greatest ride. Solyte midsole offers enhanced cushioning and strength in a light and portable package. WET GRIP outsole gives greatest grip on multiple areas, including wet areas, by utilizing a special blend of natural and non-organic components. The perforated sockliner allows for better wetness transport and waterflow and drainage for the greatest in relaxation as well as. Wt. 8.5 oz. I love this shoe! It's very busy but somehow the colors compliment each other well. I always order size 9 in Asics and they fit perfectly. There is enough room in the toe box, not too narrow or too wide. I can actually feel the arch support in these shoes. Love these wildly colored sneakers. Much improved from the model 7 - more gel, more comfortable. These are standouts - the wilder the colors the better! I ordered one size larger and they fit well! Can't wait to run in these babies! Super adorable and bright. They fit true to size and will make me smile on my long runs for sure.